All-New Stamping manufactures custom precision stampings using specialty high temperature alloys for all industries including nuclear, marine, medical, energy and telecom. Most commonly used for applications in the aerospace, chemical, power generation and high tech industries, specialty metal stampings produce parts that perform with precision and can withstand high wear and harsh environments. 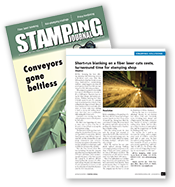 All-New Stamping’s staff has the experience and expertise to manufacture your part, whether it is a large airframe component or a miniature part of a power control panel. The most common high temperature alloys used for stamped parts are the nickel-based alloys. This is due to their high ductility and resulting toughness. These parts perform well in high stress, high temperature and high wear environments. Stamping, coining and forming are the most effective manufacturing processes for nickel-based materials. All materials used by All-New Stamping are traceable with full certifications, so you can be sure your part meets the most rigorous quality standards. We manufacture specialty metal parts using single heat lots to ensure the highest quality, precision and consistency in the finished part.